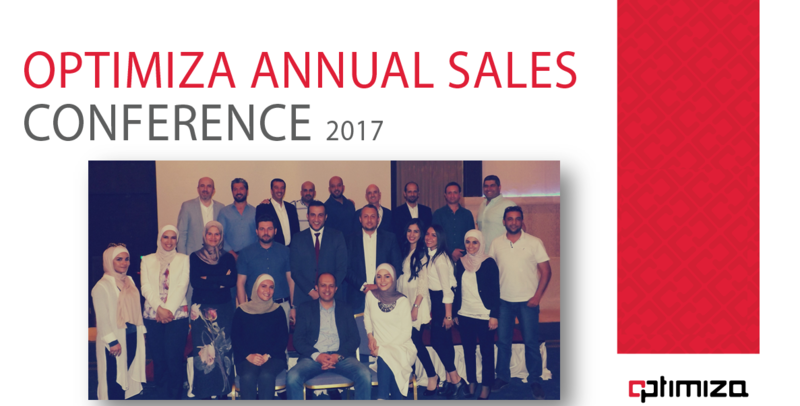 Amman, May 2017 – With aims to provide its sales team with golden opportunities to keep their fingers on the pulse of its cutting edge technologies available to customers, Optimiza, the leading publicly-listed regional ICT systems integrator (ASE:CEBC), held its annual Sales Conference at the Holiday-Inn Amman, on May 18, 2017, thus offering an ideal space for sales professionals to discuss their technical challenges and achieve advancement. Boasting a rich agenda divided into two parts, the Conference’s morning sessions were held in collaboration with Optimiza’s strategic partners Cisco, Oracle, and Microsoft, while its evening sessions were dedicated to Optimiza’s Products Line and internal offerings. More specifically, the conference sessions focused on the management’s direction in terms of sales and marketing, while also introducing teams to new technologies. Focus areas included: Security, Cloud, Infrastructure, System Integration, Big Data and Business Intelligence, as well as Optimiza’s Industry specific software applications. “I’m very satisfied with this achievement and the outcome so far, and we plan to expand this annual conference tradition in terms of our offerings, involving other divisions beside the sales team and PLMs, all to add more and more value to our employees”. It is noteworthy that Optimiza is keen to enrich its human experience through numerous programs and benefits, considering it to be one of the most important pillars of sustainable growth, and one of its most valuable assets.